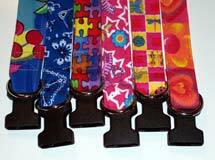 Let your pet show off her wild and crazy side in these fun print fabric collars and leashes. These fun print fabric's are available in a wide range of brilliant colors and designs in 100% cotton. Available in 1/2", 3/4"" and 1" widths in all sizes and cats with quality nickel plated hardware.